NEW DELHI ― India’s Ministry of Defence on Wednesday issued a global request for information as the country seeks to award a $10 billion deal for 123 naval multirole helicopters and 111 naval multi-utility helicopters for its Navy. “RFI for purchase 123 NMRH and 111 NMUH have been sent to Lockheed Martin (which has acquired Sikorsky) and Bell Helicopter of U.S., Airbus Helicopters of France, and Russian Helicopters of Russia,” according to an MoD official. The helicopters would be built at Indian facilities, as the purchase program is part of the new Strategic Partners policy, announced in May this year, under which a strategic partner selected only from among domestic private sector companies will tie up with an overseas original equipment manufacturer. Both the OEM and strategic partner will be selected by the MoD. “Since the current exercise is to select the overseas OEMS, the selection of domestic strategic partner will take place later this year,” the MoD official added. Domestic private companies, which will compete to be that strategic partner for both helicopters programs are Bharat Forge Limited, Reliance Defence and Engineering Limited, Larsen & Toubro, Mahindra Aerospace, and Tata Advanced Systems Limited. The Indian Navy is looking to buy 123 naval multirole helicopters valued at more than $7 billion in the 9- to 12.5-ton category. These helicopters would perform search-and-rescue and anti-submarine warfare roles. Additionally, the service seeks to purchase 111 multi-utility helicopters worth more than $3 billion in the 4.5-ton category. These helicopters will take on the roles of light anti-submarine warfare (carriage of one lightweight torpedo or two depth charges), logistics, search and rescue, observation and electronic intelligence, and anti-piracy missions, for which demand is rising in the Indian Ocean. The helos will carry rocket pods and 12.7mm machine guns. The Navy’s aging light-utility helicopter, the Chetak, is in need of a replacement. The Chetak is a licensed version of the Aeros­patiale Alouette III, manufactured by state-owned Hindustan Aeronautics Limited since 1975. In 2011, the MoD issued a global request for proposal for the purchase of 16 naval multirole helicopters in which Sikorsky (prior to its acquisition by Lockheed) with its 70B multirole helicopter emerged as the winner against NHIndustries’ NH90 of France. The fate of this tender remains unknown, and no MoD official would confirm whether the tender has been canceled or if it be part of the new purchase. The latest RFI will be replaced by a formal RFP likely next year, and thereafter the formal selection of the overseas OEM. The selection process for a strategic partner and an overseas OEM is likely to take two to three years, according to an MoD defense production official. 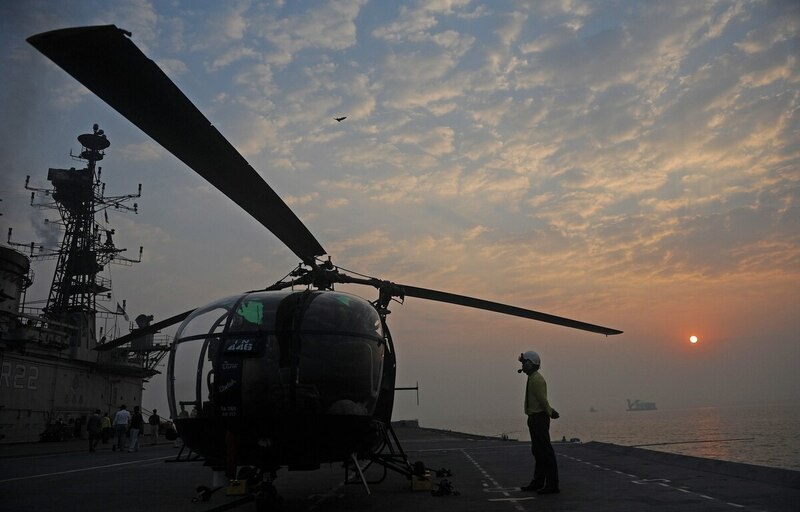 “Given the SP policy being new and MoD yet to put in place institutional framework for this policy, it is likely that the process (of acquiring these helicopters) could take up to four to five years after which the production would start in India,” the official noted.